Would Jesus Eat with Harvey Weinstein? I know I am a little late weighing in on this discussion. Instead of blogging, I've been focusing on my health. I took a LEAP test recently which is a blood test to find out what foods one might be sensitive to. I found out my body is highly sensitive to Cow's milk, sugar, buckwheat, cheddar, turkey, beef, coffee, most preservatives, and a host of other foods. I am working at cutting one food item our at a time in order to feel better and have more energy. I now understand why the Lord was telling me HE is my banquet. I am noticing however a difference after cutting out just a few of these items. I am also starting to be a connoisseur of hot tea. It's actually quite good! Anyway, if you want to get inside my head, my title question is the type of stuff I think about. I don't really know for sure the answer. Even though Weinstein's actions were deplorable, it does seem like he has become a type of scapegoat. I say this even though I could easily say, "Me Too!" because I have also been the recipient of sexual harassment. Once, I even reported it at the job I was at and nothing was done about it. I remember the way it made me feel...completely belittled and ashamed. I remember not wanting to wear skirts anymore to work...but I digress. 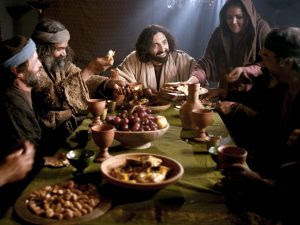 To me, it is understandable why Jesus would have eaten and hung out with prostitutes; after all, they are hurting mainly themselves and often a victim. Jesus also hung out with tax collectors though, who were considered the ultimate scum at that time because they were also robbing and hurting other people. Even so, this doesn't seem as deplorable as someone like Weinstein or how about even a child molester!? You can see that having an encounter with Jesus caused the prostitutes and the tax collectors to have a conversion of heart. Just look at Mary Magdalene and Zachhaeus. Are there some people however who are without hope for redemption? Are there sins that are just too deplorable to be forgiven? I don't think so. As stated in Zachariah's beautiful prophecy in Luke 1:78 which we also call the Benedictus and is prayed by Catholic's through morning prayer, the mercy of God is bottomless! There isn't anyone or any sins that are so deplorable that God won't forgive if they turn to him. Let's get back to the original question though..."Would Jesus eat with someone like Harvey Weinstein?" I think he would have if his Father put it on his heart to do so. You see, Jesus did what he saw the Father doing. I also know he didn't just eat and hang out with "safe" people. He hung out with people like Judas who even after hanging out with Jesus did not have a conversion of heart and ended up betraying Jesus. When I first started following the Lord at the age of nineteen, I was filled with the Holy Spirit and my spiritual senses were heightened. I suddenly became very aware of what was in the hearts of those around me. I suddenly became aware of those involved in witchcraft, Satanism, pedophilia, etc... It was a little overwhelming at the time. I also think I misunderstood why the Lord was showing me these things. I thought he was just trying to warn me and keep me safe. The more I am becoming aware of the Lord's great mercy however, I am starting to realize these people are not beyond God's mercy or redemption. The Lord's love for them is no different than his love for me. If the Lord highlights these people to me, there is hope for them and instead of trying to stay away from such people, I am asking the Lord, what he loves about them and how I can reach them. If you think about it, the ultimate justice would be for someone like that to turn to the Lord and have a conversion of heart and no longer want to hurt people anymore. Often, the victim is the one we focus on, understandably, but what if the people doing the victimizing could have a change of heart? All I'm saying is, Church, let's be open to the promptings of the Holy Spirit. He just may call us to reach out with the heart of Christ to someone we would have otherwise considered beyond hope and redemption. Look at the story of Jonah. Jonah didn't see that there was hope for the Ninevites or that they were worthy of redemption. However, in the end, he obeyed God, brought the word of the Lord to them and they repented.